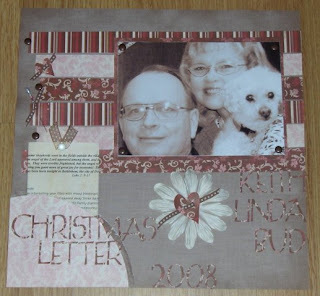 Rose Blossom Legacies: Some More "That's Amore"
I wanted a nice companion page to go along with Owen and Logan's, so I decided to take this Christmas picture of Keith, Linda (my oldest of 4 sisters), and their dog Bud. What a nice picture of them!! They are Own and Logan's grandparents, so it works out perfectly! I'd like to try and incorporate as many Christmas letters as I can into pages. They are all such nice gifts to receive every year, so I made a round pocket to store it. Here are the items I used on this layout. Unless noted everything is from Close To My Heart.